Greek refit and brokerage firm SSH Maritime completed one of its largest projects to date by relaunching the 80.2 metre Blohm & Voss superyacht Grand Ocean last month (July 25). First launched in 1990 by the German yard, she features exterior styling by Platou Architects, which has been refreshed and updated, as this aerial image shows. Capable of a top speed of 18 knots, Grand Ocean is a truly globe-trotting superyacht when trimmed back to her cruising speed of 14 knots, with an impressive maximum range of 9,100 nautical miles, and her refit was managed by naval architect Vasilis Lagogiannis. Greek refit and brokerage firm SSH Maritime completed one of its largest projects to date by relaunching the 80.2 metre Blohm & Voss superyacht Grand Ocean last month (July 25). 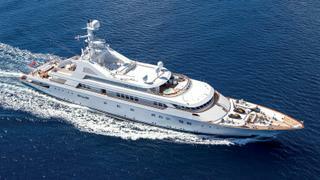 First launched in 1990 by the German yard, she features exterior styling by Platou Architects, which has been refreshed and updated, as this aerial image shows. Capable of a top speed of 18 knots, Grand Ocean is a truly globe-trotting superyacht when trimmed back to her cruising speed of 14 knots, with an impressive maximum range of 9,100 nautical miles, and her refit was managed by naval architect Vasilis Lagogiannis. Grand Ocean’s interior was originally conceived by the late Alberto Pinto, and the design SSH team, led by Sofia Mandouvalou, was sensitive in its updating of the décor. 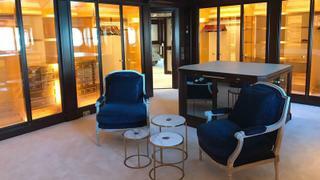 This photo, taken in the newly added main-deck dressing room, shows off the fresh carpets and upgraded upholstery. The scale of the work makes SSH’s timeframe of five months from beginning to end all the more impressive. As you might expect from a superyacht of her size, Grand Ocean boasts a superb aft-deck swimming pool and this is another area that was carefully upgraded during the SSH refit. This popular relaxation spot was fully refurbished with new ceilings but retains a clean and uncluttered vibe, with separate areas for lounging, sunbathing and dining. 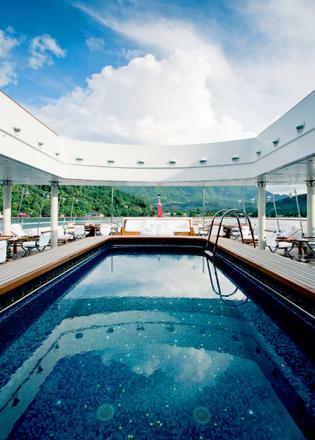 Those looking for a more intimate place to take a dip can head to the superyacht sundeck, where Grand Ocean boasts a hexagonal spa pool. 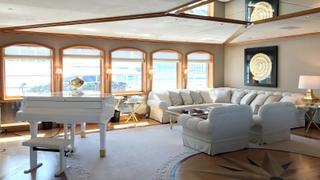 Accommodation on board Grand Ocean is for 14 guests, but she boasts entertaining space for many more people. 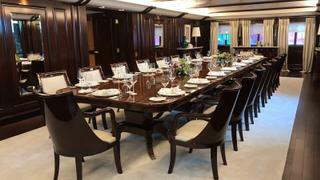 The main-deck dining room is a brilliant example of this, with seating space for up to 18 guests around a large wooden table. This photo brilliantly sums up the atmosphere on board Grand Ocean — a timeless combination of classic and modern design elements. Guests relaxing on board Grand Ocean are truly spoiled for choice, with an intimate upper deck lounge and a more expansive upper deck saloon (pictured). Light upholstery combines with warm woodwork and arched windows to create a light and airy atmosphere, while the on-board piano allows for some musical entertainment after dinner. There are seven guest cabins on board Grand Ocean, but the most impressive is the main deck master suite, with its en-suite bathroom and elegant décor, which now benefits from upgraded, linen, wallpaper and ceiling fabrics. Currently listed for sale with SSH Maritime, Grand Ocean is also available for charter in the Mediterranean, with a crew of 29 people to ensure every whim is catered for. 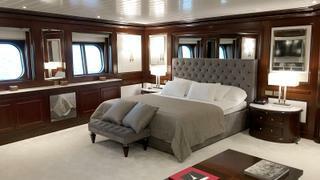 There are seven guest cabins on board Grand Ocean, but the most impressive is the main deck master suite, with its en-suite bathroom and elegant décor, which now benefits from upgraded, linen, wallpaper and ceiling fabrics. Currently listed for sale with SSH Maritime, Grand Ocean is also available for charter in the Mediterranean, with a crew of 29 people to ensure every whim is catered for.